For what is meant to be a relaxing outdoor refuge, a deck can sure be a lot of work. Sanding, power-washing, refinishing: The demands are enough to make some homeowners wonder whether having a deck is really worth all that regular maintenance. Has yours become more of a worksite than a pleasure pad? Consider making the switch from wood to composite decking. Though variations exist, composite decking is generally made from a mix of wood scraps—called wood flour—and plastic particles. Although some manufacturers rely on virgin wood and plastics, others make extensive use of recycled materials. In 2010, Trex reused 3.1 billion plastic grocery bags, while TimberTech says that each year its products incorporate 107 million pounds of post-industrial and post-consumer waste materials. As part of their manufacture, composite deck boards are treated with preservatives that help ward off rot, mold, and mildew. Planks are dyed in a host of a colors and imprinted with a range of textures, most of which convincingly resemble genuine wood grain. Some composite decking products carry warranties of up to 25 years, but these typically apply only if you install the deck according to the manufacturer’s directions; be clear on what those are prior to construction. Low-Maintenance. 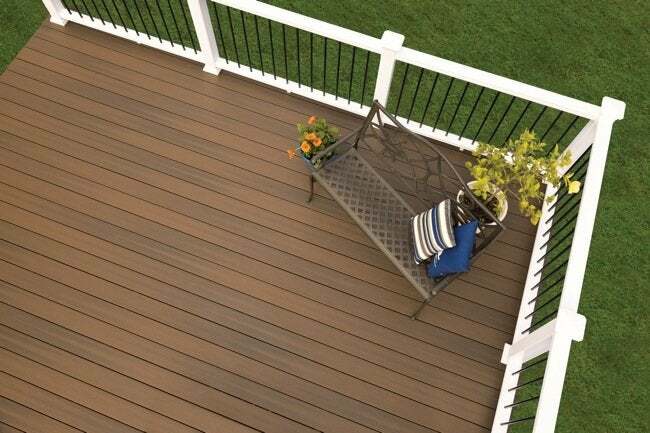 Because of its plastic content, composite decking neither splinters nor rots, and it resists mold and mildew. Compared with wood, which requires cleaning and regular staining and/or sealing, composite boards make for a “build and chill” project. Hands down, easy care is the biggest plus for this material. Sustainability. 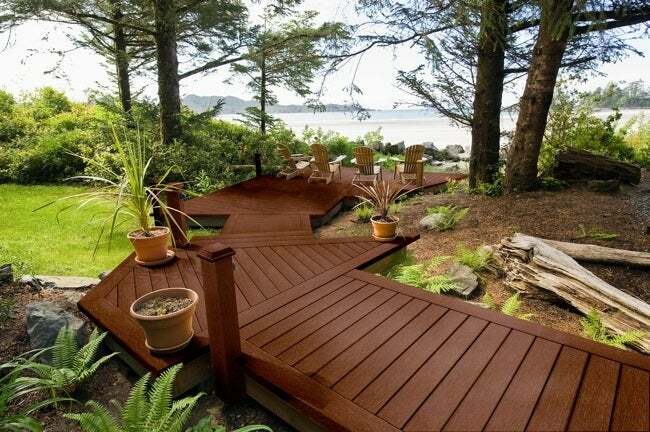 The eco-benefits of composite extend beyond the recycled materials used in the decking’s manufacture. Because the components are virtually maintenance-free, gallons of stain and/or sealant are saved. More durable than wood, composite decking stays out of the landfill longer. Longer Boards. Whereas wood planks are typically sold only in 16-foot lengths (longer boards can sometimes be specially ordered), composite decking is routinely available in board lengths up to 20 feet. That means you can have fewer seams on your deck, depending on its dimensions. Hidden Fasteners. Composite decking often goes down the same way as wood, that is, with stainless steel decking screws. But some manufacturers offer products with clip or tongue-and-groove assembly. 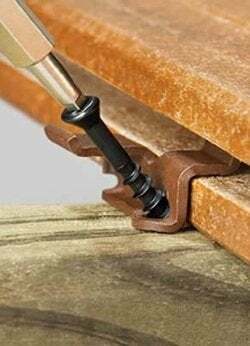 These easy building systems result in deck surfaces without unsightly rows of visible screw heads. Cost. According to Popular Mechanics, basic pressure-treated lumber goes for about 80 cents per linear foot, while redwood or cedar runs up to three times that amount. Composite decking materials, on the other hand, sell for $2.50 or $3.50 per linear foot. Even so, when you account for the costs associated with maintaining a wood deck (which has a shorter lifespan to begin with), composite decking emerges as the value choice. Strength and Weight. Though comparatively heavier in weight, composite decking tends to be slightly less strong than its wood cousin, so a deck built from composite components must have additional supports. It Can Stain. Plastic is largely responsible for many of the positive features that define composite decking, but the material also includes stain-absorbent wood. If you accidentally get grease or another offending substance on a composite board, you cannot simply sand out the stain. It Can Scratch. Because you cannot sand composite decking, deep scratches are destined to remain in the boards, though over time, they may becomes less and less pronounced. It Can Fade. Most composites fade a bit in the few months immediately following installation, but in general, this type of decking holds its color for years, never assuming the neutral gray so common to aged lumber. Before choosing a color for your composite decking, ask to see samples of weathered boards, if possible. If you already own a wood deck, check out Gossen’s Deck ReCover. This product involves U-shaped PVC boards that fit over your existing deck, giving it the benefits of composite for a fraction of what it would cost to demolish a wood deck and build a new one from composite planks.